Sprint today said it would get into the managed SD-WAN arena in early 2017 with an offering using VeloCloud’s technology. Sprint said it is currently teaming with VeloCloud to support customer trials for its SD-WAN service during the fourth quarter of 2016, with a global launch planned for early 2017. The carrier said that its SD-WAN services customers will be able to use new or existing Sprint MPLS or broadband internet connectivity, as well as bring their own broadband services from other providers. Sprint will manage the customer’s SD-WAN across any transport vendors, the company said. Network World columnist and Principal Analyst with Essential Solutions Corp., Linda Musthaler wrote of VeloCloud last year that one of the company’s strengths was its ability to support multiple connectivity methods. “The solution is said to be easy to install and connect, so non-IT personnel in the branch can do the work. It allows the branch to use any type of physical transport connection they want: MPLS, cable, DSL, cellular LTE, and so on. VeloCloud accommodates all the intricacies and specialties of these various connections to improve their typical performance, even for rich applications. And of course, application traffic can be steered as needed so that branch offices can go directly to the SaaS applications on the Internet without going through the corporate data center first,” she wrote. 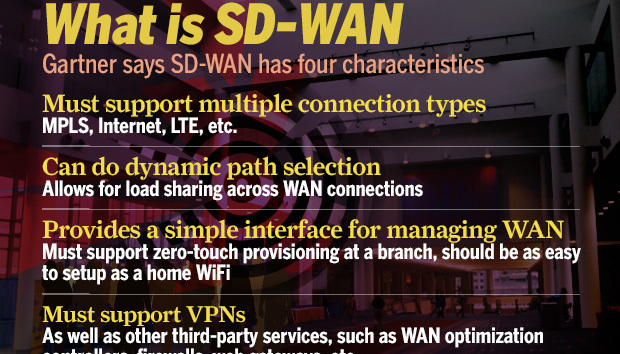 “Sprint SD-WAN will transform the way our business customers use their network. SD-WAN enables enterprises to lower their network costs while dynamically supporting converged services such as SIP Trunking, cloud services, and hosted applications,” said Mike Fitz, vice president of Sprint Global Wireline Business Unit in a statement. Like others in this emerging market, Sprint says the migration of voice, data, and video on the same all-IP network, the explosion of cloud services, the mobile workforce is driving enterprises to consider SD-WAN technologies for flexibility, performance and security. Indeed the market for SD-WAN and managed services around it is heating up. In March researchers at IDC said that 30% of enterprises plan to migrate to SD-WAN within two years and that the overall market would be worth $6 billion by 2020. Gartner too sees big things for the technology saying by year-end 2018, 10% of enterprises will have replaced their WAN routing with some iteration of hybrid-WAN-based technology. The Sprint announcement is hot on the heels of rival AT&T saying it would be offering a managed SD-WAN service next year also based on technology VeloCloud. Verizon earlier this year said it too would offer an SD-WAN service with technology from Viptela.